I really love Easter. I have pared down my decor over the past year, but I still love to decorate for the holidays. 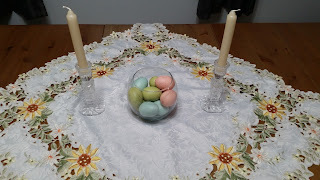 I love traditional Easter colours with pastel pink, green, blue and purple. 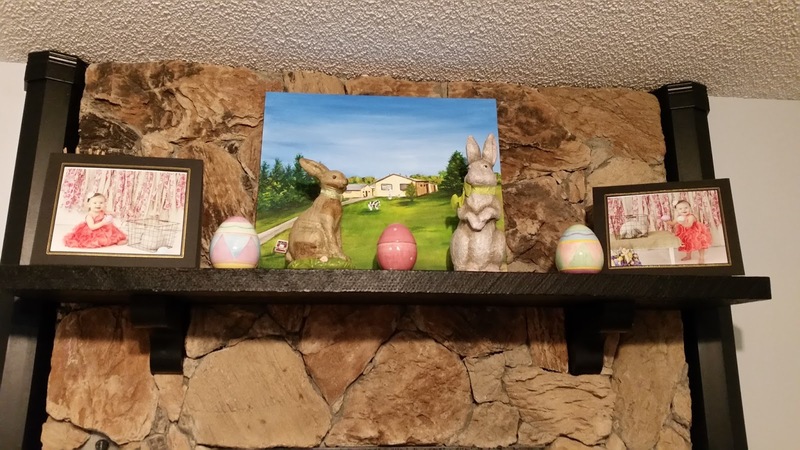 Our new house has a fireplace so I was so excited to decorate the mantle. 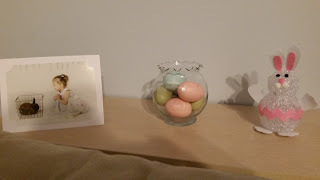 The eggs on the mantle are from Dollarama and my other decor is from Homesense. I bought all of the decor a few years ago and I love pulling it out every year. 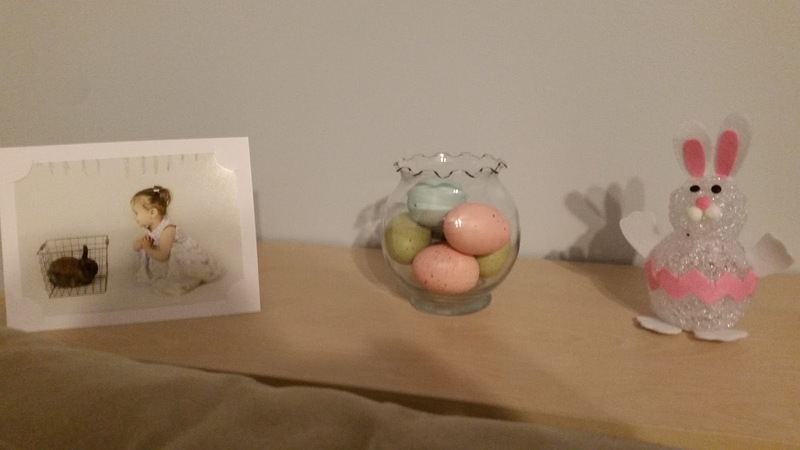 We have traditionally had Easter pictures taken of our daughter (this year's date didn't work out because we were out of town). 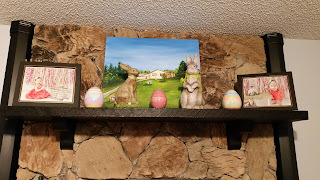 I enjoy displaying her Easter photos along with the other decor. Hubby's family is coming down to celebrate Easter with us. I am planning to do our 'big meal' on Saturday, as his family has to leave on Sunday. Hubby's birthday is next week so we will be celebrating that, as well! Hubby's Mom is bringing Pistachio Layered Dessert for his birthday cake. She makes the dessert with Oreo cookie crumbs on the bottom instead of the nut bottom. She then grates chocolate over the top of the dessert. On Sunday, I plan to cook a roast beef in the slow cooker. I will serve it will roasted potatoes, veggies and salad. Our Mass doesn't begin until 11 a.m. so I need a lunch that sort of looks after itself. I love using my slow cooker for this! I am very much looking forward to celebrating with family this weekend. I am thankful for the Sacrifice that Christ made for us and I enjoy celebrating the Resurrection. He conquered death so that we could live. It is an amazing event to celebrate. I hope you all have a joyous Easter! 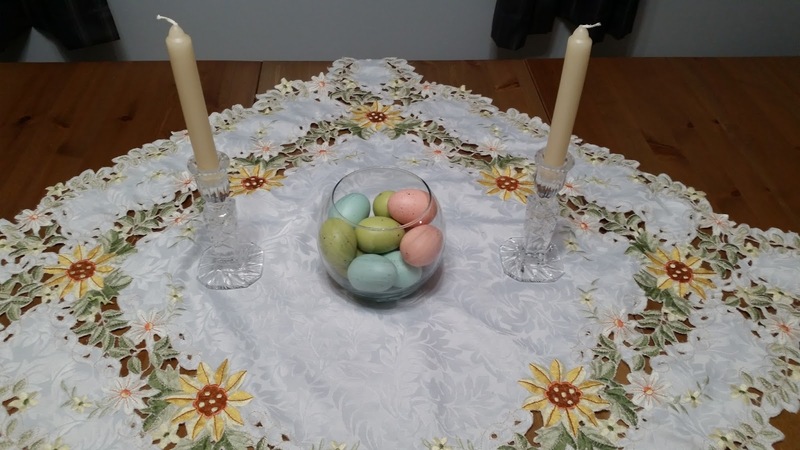 Your Easter menu sounds delicious and so does that dessert your MIL makes! I hope you had a great Easter! Thank you, Emily! We had a good Easter! I hope you did, too!